Part Traveller, Part Poet, Part Engineer! Today I'm here in Vengurla on a short backpack trip. 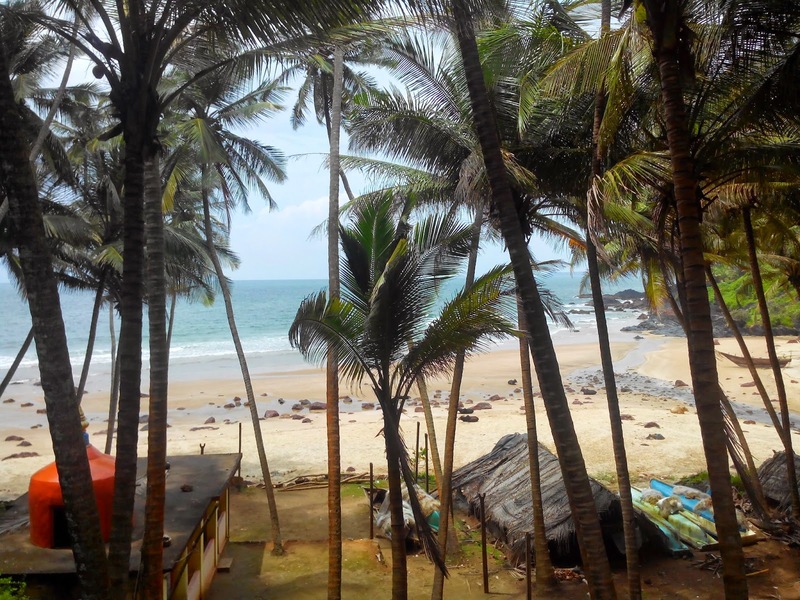 The aim being to explore around the area, check out a few virgin beaches, some unspoiled nooks and private crannies. Also, the plan is to make this a live blog of this trip: note down everything ... as it happens, when it happens. The blogger app on my phone will be my aide in this quest. Of course the battery and network play important roles too. I'm using the classical pen and paper for backup though. Tejal is partnering me on this trip. A much needed reality connect. I did not ask many people for this trip in the first place. And since me and Tejal are the only people on this trip, I've tried to arrange a bike for us to roam around. Tejal drives of course. We have confirmed sleeper tickets for the return journey in the 01090 MAO-CSTM holiday special. We board at 1730 hrs from Sawantwadi on Sunday, 26th April and reach Panvel at 0300hrs on Monday, 27th April. However, we don't have tickets for the onward journey. Two attempts on two days for the tatkal ticket resulted in failures. Why did IRCTC not have SBI listed for debit card transaction on that day? No answer. Effectively, we have to travel from Mumbai to Sawantwadi cattle class. Well, ain't this the true romance of the backpack trip ... May God save us from such unruly thoughts. Back to work now. The trip begins soon. Found this as a result of a cursory google search for "Cattle Class"
I'm at the Dadar Terminus ticket counter. Two Dadar-Kankavali general tickets in the 22629 Dadar-Tirunelveli Superfast express cost us Rs 370. The clerk at the counter was a poster-boy for the 40-something disgruntled government employee. Dismissed me with a wave of his hand after handing me the ticket. I try to call up Mahesh - our contact for the bike at Sawantwadi. He doesn't pick up. Mahesh is a cousin of my my friend and ex-colleague Abhi (-shek) Dalvi. Abhi has been helpful with arranging the bike. I make my way to platform #8 at Dadar central. The line for the train is already in place and three coaches long. It's almost two hours for the train to depart and still we have this huge line. The plus side - for this train atleast - is that the train has six general coaches. So there's a decent possibility of us getting a seat. I get in line and dial up Tejal. She'd leave office shortly she says. Our plan as of now is to get to Kankavali in this train and then check whatever means we have of reaching Sawantwadi from there. The people around me says that the general compartment gates open at 1900 hrs. I hope Tejal makes it by then. The train has come on the platform. There are three general coaches on either side. We should get a seat today. No signs of Tejal yet. Tejal arrives. Gates have not yet opened. She sees the line and gasps. I explain her the concept of the general coach line and the ensuing chaos in absence of one. I gasp at her backpack. Its merely 10l large. To put it into perspective, its as big as my two arms put together. I wonder what she's stuffed there. I hope its enough. Gates have not opened yet. We are bored. Tejal had brought a pair of vada-pav for both of us. We've finished that. We need some water, but cannot leave the line. Gates may open anytime. Got through to Mahesh. He's asked us to call him when we reach Sawantwadi tomorrow. The gates have finally been opened. And its chaos. Everybody apparently forgot that a line had existed here moments before. We rush in, but get no seats, despite being among the first dozen people in through the coach. We alight, dejected. No point standing for eight hours straight. There's an empty bench in the next coach. We enquire , if its taken. The lady sitting there welcomes us. She'd fought for the berth for her husband and family but the husband found nice seats elsewhere. So we get seats! We are elated! The strap of Tejal's watch broke in the process of us not getting a seat. A fair casualty one must say. Tejal will curse me when she reads this :). I go get some snacks and water for the journey. Tejal orders a veg Biryani in the train for both of us. There's no chaos anymore in the compartment. All settled. The train leaves. All well. Except for the kid on the opposite bench. She's a cute little annoyance. My phone's battery is down. Give a call home and shut it down. It would be better to maintain the blog with paper and pen instead of the mobile. Anyway, I'm not hoping for a decent network in most parts of our trip for the next two days. Train reaches Thane. All window shutters and doors are closed so that no one enters. The space inside the coach is precious. Not that many people try to board in Thane though. Most of the co-passengers are from Ratnagiri. Seems like the coach will be 50% empty after Ratnagiri. High hopes of some decent sleep. Same scenes at Panvel. But hawkers do get in despite the best efforts of the Ratnagiri musclemen. We finish our biryani with the help of some chips. We try to sleep in the sitting position. The train is moving good. We've passed Roha some time back. Not much sleep possible. But try to doze off once in a while.